Time really does fly, as it has now been nearly 5 years since William and I renewed our wedding vows on 11-11-11, our 5-year anniversary. We had such a good time that we are doing it again for our upcoming 10-year anniversary. I am completely undecided about what I will be wearing. We will be having some portraits taken, so I’m tempted to go more formal, but at the same time, I was thinking that festive casual might be the better choice, for ease of movement and comfort throughout the evening. Either way, I did learn my lesson about heels last time. I either need to bring flat shoes with me or just wear flats for the whole event. I digress. The more important factor here is that this is an Elvis wedding. We have a full Elvis ceremony, where Elvis will be performing the ceremony and singing multiple songs. 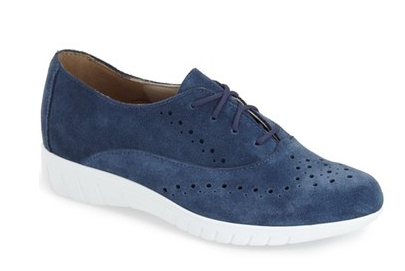 Obviously, it seems like the right time for, you guessed it, blue suede shoes. Check out some of the selections I am considering! The AV Club has launched a series called “Soundtracks of Our Lives” and did a full examination of the soundtrack to The Crow, from 1994. I wish I had more pictures from around that time, when I was totally getting out of “grunge” music and more into way darker stuff, particularly Nine Inch Nails, introduced to me by my friend Tiffany. The Crow soundtrack had a Nine Inch Nails song on it, and that was enough to pull me in, but that soundtrack became something I could listen to all the way through. When I met my husband Will – I found out that he too loved the soundtrack, and even had the CD of the film’s score, an elusive piece of music to find even when the movie was so popular. That, along with the fact that he had more Nine Inch Nails halos than I did, made him immediately super cool in my eyes. Back to topic – The Crow soundtrack, 22 years later, still evokes a lot of emotion for me, and a lot of memories of laying on my bed or the floor, listening to it all the way through. I think I still have an ENORMOUS poster of Brandon Lee as Eric Draven somewhere in my storage unit. It was a formative movie and soundtrack, and I loved reading this piece about it. I searched online the other day for Cahill’s Whiskey Cheddar Cheese. I used to buy this at Whole Foods and then they stopped stocking it. I have now found it online, at iGourmet.com, which is barking right up my tree. 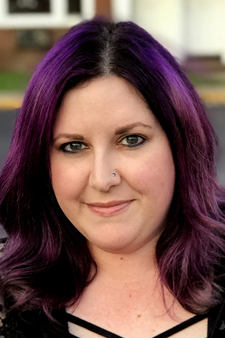 Shauna (Nubby Twiglet) wrote about creating a personalized workspace. I have a tiny desk in our apartment, so at the office, I’ve done quite a bit of personalization. I will put my office together a bit more and post about it soon. I’m really excited for the Olympics, and gymnastics in particular. Here’s a great video about Aly Raisman’s spectacular floor exercise. A wonderful human put all of season 6 of The Grest British Bake-Off on YouTube, including the Masterclass episodes that I had never seen! An artist redrew their childhood art, and it is magical. It is like seeing the intention of the original piece. Photojojo gives you a guide to splash photography. New York Magazine gives us French cult pharmacy products that you can buy on Amazon. Today, an examination of a product that brings me so much joy. 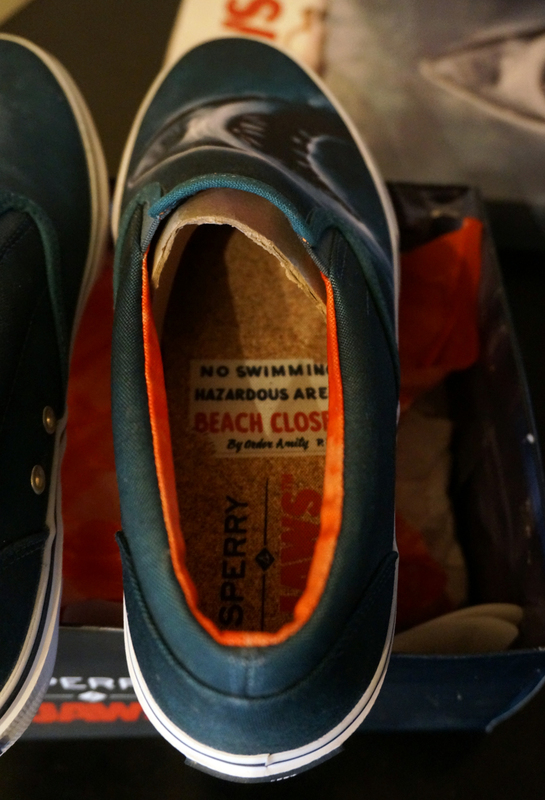 I wish I remembered where I first saw that Sperry was releasing a line of Jaws-themed shoes for the summer. 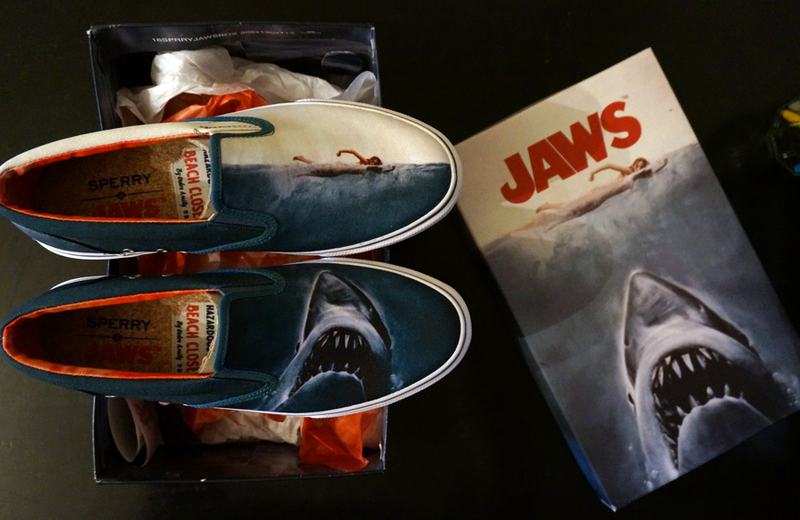 As soon as I did know, I was on the Journeys website, shopping for a pair of slip-ons that fulfilled every need I have as a massive fan of the original Jaws film. Once I received them, I was even more excited. Lots of photos to come! The top of the shoe box. 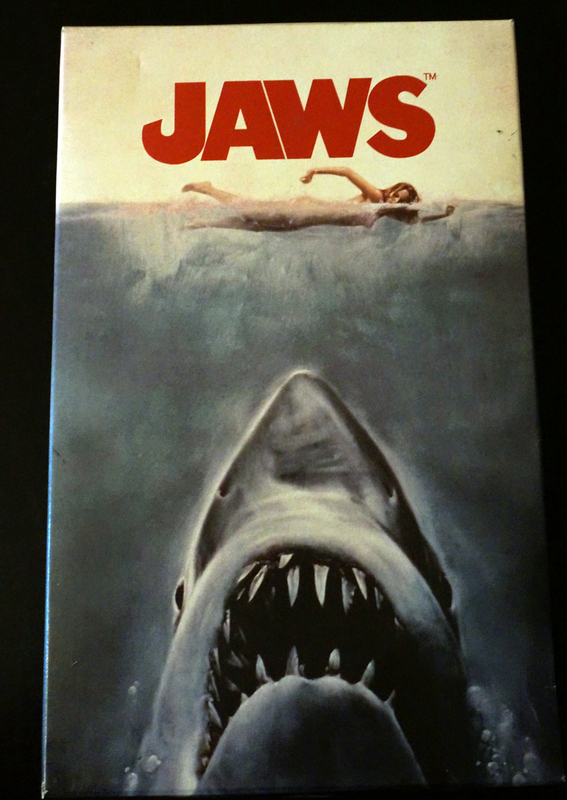 Note the TM on the Jaws logo. I noted on a previous Star Wars x Vans post that I found it strange that the Star Wars logo does not feature a trademark. The commitment to excellent packaging here is so wonderful. 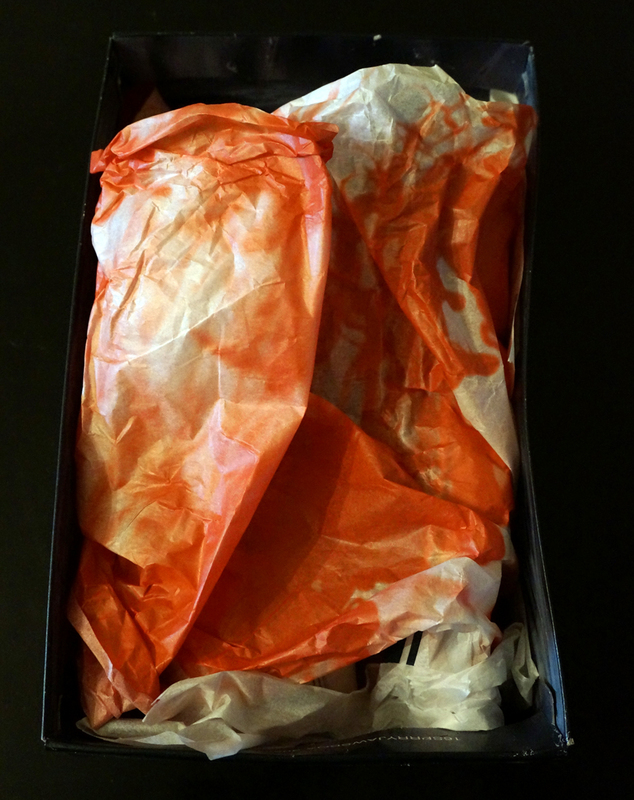 Custom boxing, custom tissue paper, it’s all there. A blurryish look at the inside of the shoe shows a continuation of the bloody cloth theme in the shoe liner, and an incredible recreation of the famous “Beach Closed” sign from the film on the inside of the shoe. I cannot say enough about product design of this nature, meant to be a constant delight to the person who is buying something. As such a big fan of the movie, I am so charmed by the attention to detail taking place inside my new shoes. I am excited for the Sperry designers to have gone the distance in creating a pair of shoes that are a true collector’s item. 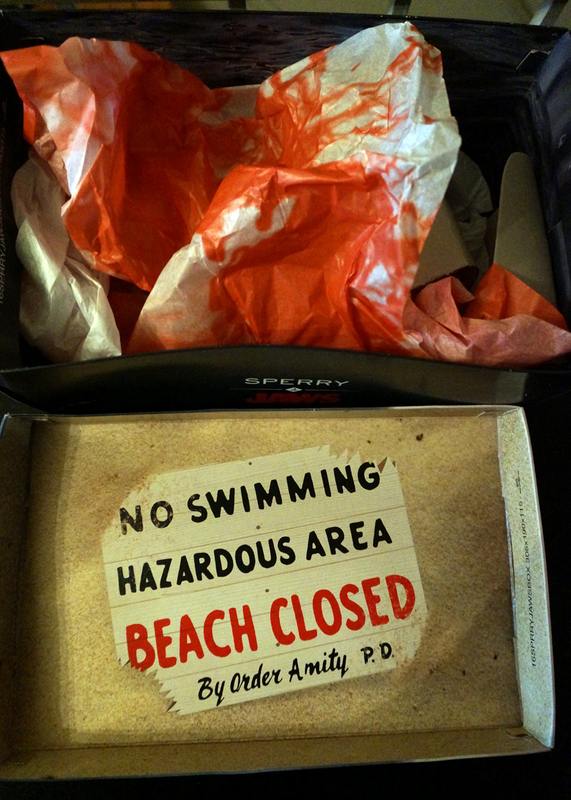 The inside of the lid of the box also features the “Beach Closed” sign. Check out my new favorite sneakers. They are truly amazing. Congratulations to the Sperry team for this amazing collaboration, and incredible commitment to design. 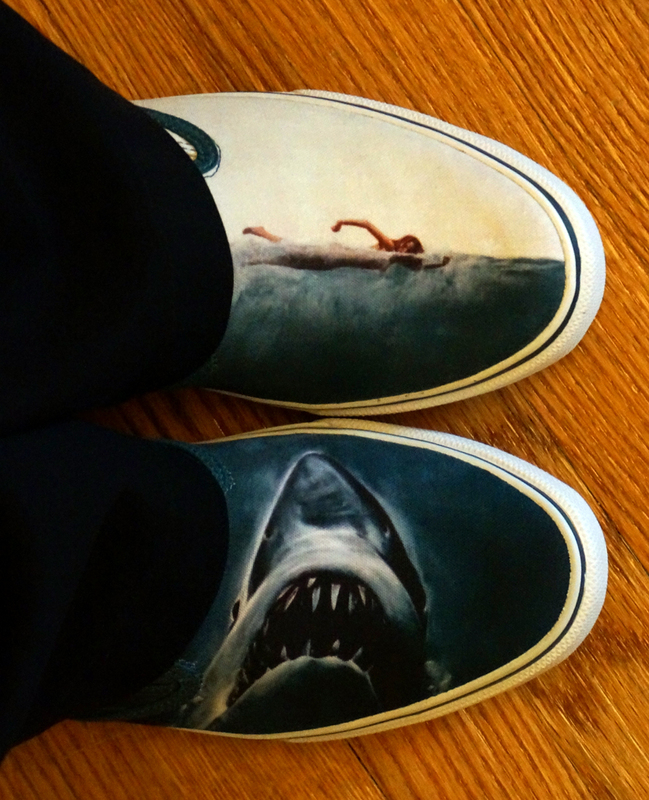 My slip-ons seem to be the most popular option in the Sperry x Jaws collection. 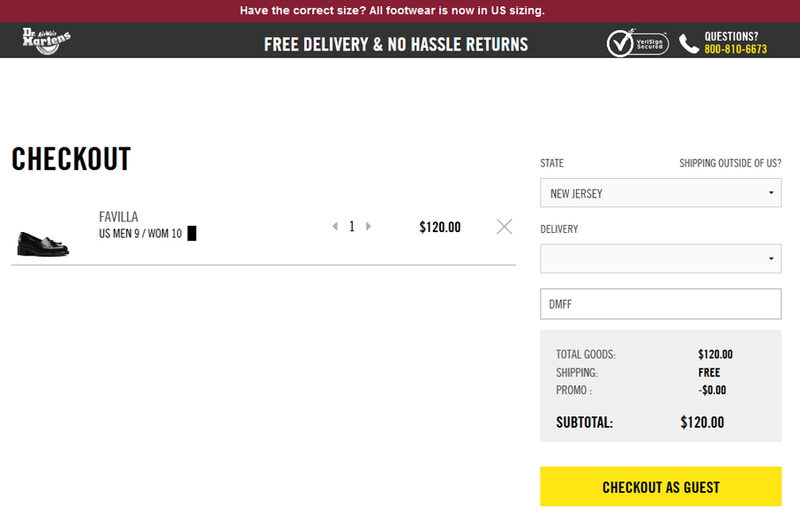 They can still be purchased on Journeys.com. 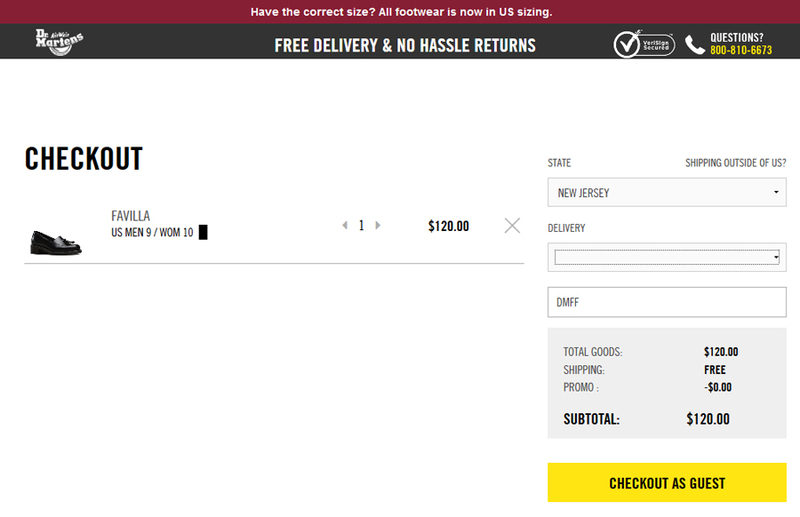 Sperry is still offering the other shoes in the collection – see below. I have not been shy about my feelings about Dr. Martens shoes and boots on this blog. I have quite a few pair, and even talked about my first pair, a major experience in my teenage years, here on the blog. 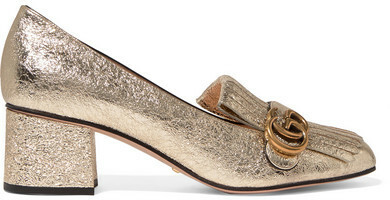 I check in on their website pretty regularly to check in and see what’s new, and this week, I ran across a pair of heeled loafers that looked perfect for me. When I went to purchase these, it was much more aggravating than I expected. 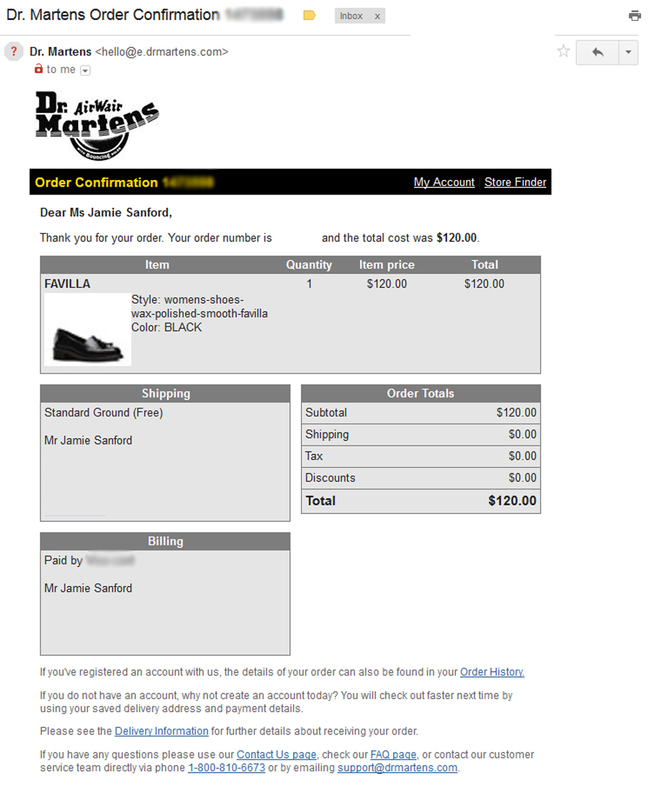 I don’t remember this happening before, but I will admit that it has been a long time since I made the purchase directly from DrMartens.com. 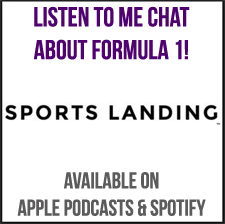 The shopping experience is quite good, and I may explore that further at a different time, but for now, I want to address issues I had during checkout. The cart page is really clean and simple, which I like. I looked up coupon codes online and went to try them out on this purchase. You can see where I put DMFF in the box, but after I put it in there, a little thinking circle moved in the box, and then disappeared. It apparently isn’t valid, but the site doesn’t tell me that! It seemed broken until I realized that it was showing me in the most minimal way that it was processing the code. I can clearly see the “0.00″ off for my promo code, so I’m guessing it isn’t working. However, it is super disappointing that they aren’t telling me that my code is invalid in a much more significant way. Fail number 2 was that there was something up with the shipping options. I chose my state, that was easy enough, but then, when I used the “delivery” dropdown, it gave me 3 listings for “unverified.” Wth. I ended up going back to the homepage and re-navigating to my cart, and it had pre-populated the free shipping option for my order over $50. I know I said that this page being clean and simple was great, but a little bit more going on is fine, especially if it is going to make it more user-friendly. Further into the checkout process, I had issues changing my billing address. It took a minute for me to realize that this was because the checkbox for “my billing address is the same as my shipping address” was below the address fields and I had not scrolled down far enough to see it. I was unable to edit the billing address until I had unchecked the box. 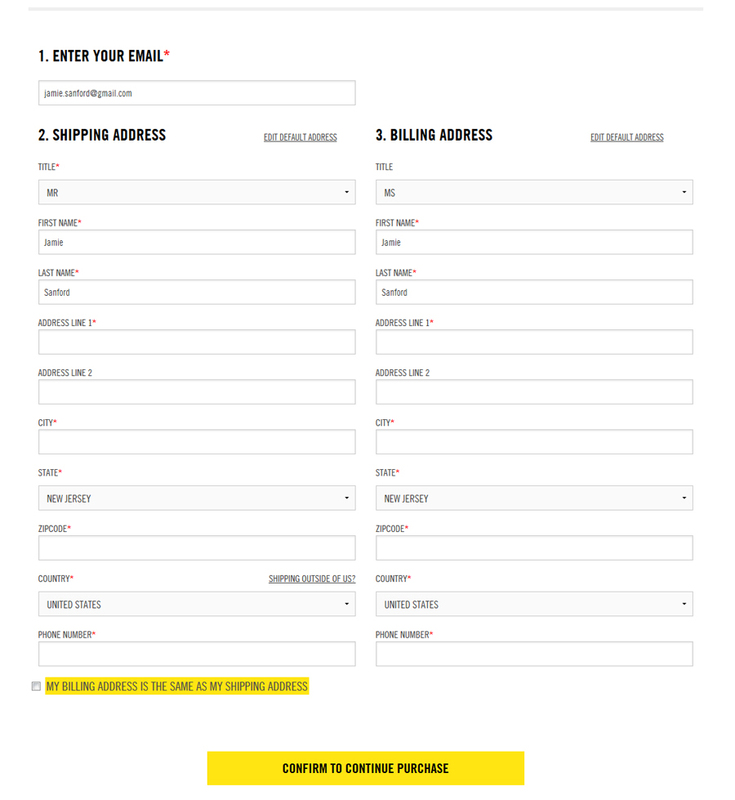 This needs to be moved to above the address fields. Here is my order confirmation. The order confirmation screen was short, so I expected more information in the email. Yet again, I run into the issue of a company not giving me any indication of what their order processing time is, how long I should expect to wait before receiving the tracking information. This is basic stuff people! Even a biggish window of a few days is better than nothing, and I know from experience that many customers think that all companies are running like Amazon and shipping orders within hours. I know this is not the case for many online retailers, and we need to keep everyone’s expectations managed properly.